Bosch, the German electronics giant, is making a strong showing at the Frankfurt Motor Show (IAA), and showing off its solid-state Li-ion battery technology. It recently acquired Seeo, Inc., an American startup that has been developing such a battery for several years, and will add Seeo’s research to its own expertise and exclusive patents. Encouragingly, the company says it will be able to double the energy density of Li-ion batteries while cutting prices by half. Perhaps discouragingly, Bosch says this will take until 2020 to bring to production. Seeo provides the first sample cells which Bosch thinks meet automotive industry standards for durability and safety. Dr. Rolf Bulander, Chairman of the Bosch Business Sector Mobility Solutions, claims, “Availability of the [EV] technology is not an issue, what is currently the roadblock to electrification is cost of the battery and it has to be solved. And when it is, electrification will take off.” He sees doubling the range and cutting costs in half as crucial, obviously looking at Bosch’s projections that globally there will be as many as eight million EVs on the road by 2025, along with another eight million PHEVs (plug-in hybrid vehicles), five million hybrids and 11 million mild hybrids. The latter is an area Bosch in which Bosch is particularly interested, having created a 48-Volt mild hybrid system of its own. Lux, a group specializing in research and consulting on emerging technologies, indicates there are other solid-state players in the game, and gives its opinions on whether they are long-shots or sure things – at least as much as market foibles allow. 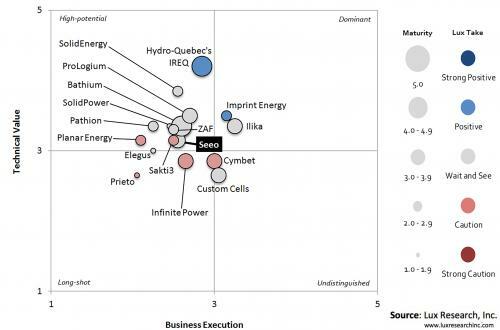 Imprint Energy, Ilika, and ProLogium on the start-up front, and Hydro-Quebec’s IREQ arm on the industrial laboratory front, represent what Lux thinks are better bets for investors. Others, some of which we’ve reported on in this blog, included Infinite Power Solutions, recently acquired by Apple; Sakti 3 and SolidEnergy, invested in by GM; and Quantumscape and Oxis Energy, both involved with VW. 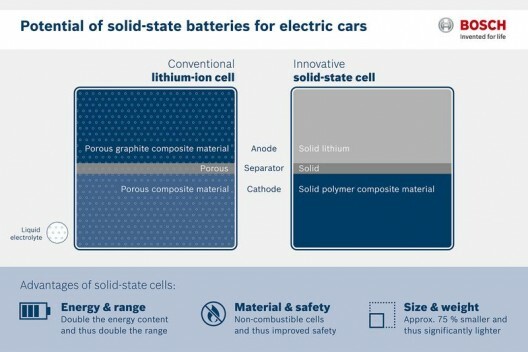 Lux thinks there might be “a likely buying spree of next-generation battery technology over the coming years,” leading to an “unstoppable flow of plug-in and other electric vehicles.